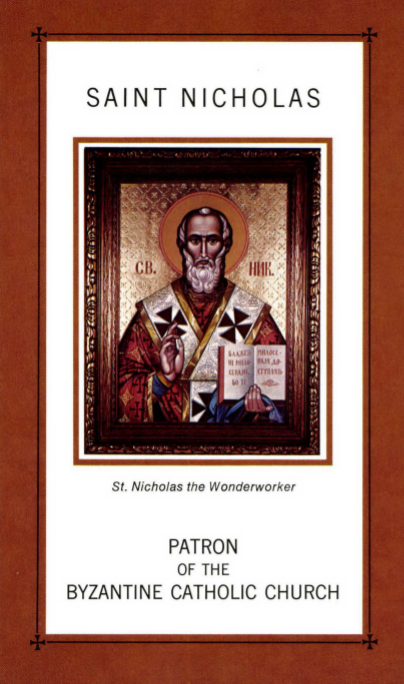 One of the most popular and venerated Saints among the Ruthenian people is St. Nicholas the Wonderworker, the Archbishop of Myra in Lycia, Asia Minor, who died in the middle of the fourth century. His name is equally honored among the Christians of the East, where he lived and died, and of the West, where his precious and venerable relics, which secrete a miraculous ointment, called “Manna of St. Nicholas,” are preserved. 1. There were many books and studies written about St. Nicholas as early as the ninth century in which oral tradition concerning his life and his work are meticuously recorded. The first Life of St. Nicholas was compiled by a certain monk, Michael, whose identity is unknown to us. Unfortunately, early biographers confused St. Nicholas of Myra with Abbot Nicholas of Sion, bishop of Pinara in Lycia (d. 564), and inserted into his biography many living legends that were circulating among the people. For this reason it is hard to reconstruct a true biography of St. Nicholas, which throughout the centuries has been constantly expanded and embellished by the hagiographers. According to tradition, St. Nicholas of Myra was born about 270 A.D. in Patara, a small town in the province of Lycia (presently in Turkey), the only son of a rich family. Attracted to the religious life, he spurned his inherited wealth and used it for charitable work, for which he became famous from his youth. St. Nicholas lived in the period of religious persecution under Diocletian (284-305), during which he suffered imprisonment because of his Christian faith. Consequently, he was venerated as a Confessor of the Faith by the local people. At the time of Emperor Constantine the Great (306-337), he, by Divine intervention, was elected Archbishop of Myra, the capital city of Lycia, called Dembre by the Turks. As a Spiritual Shepherd, St. Nicholas distinguished himself for his pastoral zeal and uncommon goodness of heart. He also worked miracles which made people consider him a Saint even before his death. He strongly defended the Faith at the Nicean Council (325) and protected his flock from paganism and the Arian heresy. He assisted the poor, protected the innocent, comforted the suffering and the sick. Several times during his episcopacy St. Nicholas saved his people from imminent starvation. He died on December 6, 345 or 352, and is commemorated in the liturgical calendar on the anniversary of his holy death. 3) St. Nicholas, blessed with the charism of healing, restored health to innumerable people suffering from incurable diseases ; 4) st. Nicholas, warned by God, secretly provided a dowry to three poor girls, destined by their own father to a public-house of sin to provide him with a steady income. Not to expose the father’s sinful design, the Saint secretly, during the night, left a bag of gold pieces for each girl as a dowry for them and to enable each of them to lead an honest life. The tenth century biographer, Metaphrastes, whose true name was Simeon Logothetas, wrote that this ” unique deed” of St. Nicholas was known to the people as a whole (P.G. 116, 328A). In Europe this particular deed of St. Nicholas was embellished by local folklore and made him the ” Good Old Bishop,” who brings presents to children. In English speaking countries his episcopal garb underwent considerable change and his name became corrupted into Santa Claus, the bestower of gifts at Christmas time. 3. The public veneration of St. Nicholas started very early after his death. Fifth century records indicate that his grave became the site of numerous pilgrimages. People came from far to venerate his relics and to implore his intercession, and many miracles were recorded at the site of his tomb. Thus St. Nicholas, after the Blessed Mother and St. John the Baptist, became the most venerated Saint in the Byzantine Church. The solemn celebration of the feast of St. Nicholas was introduced in Constantinople during the rule of Emperor Justinian I (527-565), who built a magnificent church in his honor in the Blachernae quarter of the city. The liturgical services venerating him were considerably enriched by St. Theodore Studite (d. 826) and two Patriarchs, st. Nicephorus (d. 829) and St. Methodius (d. 847). The oldest encomium-praise in honor of St. Nicholas-is preserved from the beginning of the eighth century. It was delivered at his grave site by St. Andrew of Crete (d. 740), who called him a ” pillar and support of the Church” (P.G. 97, 1191- 1206). In the Western World, the first church in honor of St. Nicholas was built in the Lateran quarter of Rome by Pope Nicholas I (858-867) . From that time on, hundreds of churches have been erected in his honor and the veneration of him continued to extend to various countries. His veneration in Europe was greatly enhanced by the translation of his holy relics to Bari, Italy, in 1087. 4. In 1036, the province of Lycia was occupied by the Saracens who prohibited the veneration of St. Nicholas at his grave. Merchants from Bari, Italy, who at that time were still following the Byzantine Rite, decided to ” steal” his venerable relics and translated them to their own place on May 9, 1087. Pope Urban II solemnly deposited the Saint’s holy relics in a marble sarcophagus under the main altar of a magnificent basilica built in Bari where they are still publicly venerated, and where he continues to bless the devoted pilgrims with new mi racles. The solemn translation of St. Nicholas’ relics was witnessed by Theodore, the envoy of Metropolitan John II of Kiev (1080-1089) to Pope Clement III. In his ” Skazanije,” entitled The Narration of the Translation of the Relics of Our Father Nicholas of Myra, the Wonderworker, Theodore masterfully described the moving event and became instrumental in the introduction of the celebration of the feast of the Translation of the Relics of St. Nicholas to Bari in the Metropolitan Province of Kiev, which is celebrated on May 9. The Feast of Translation eventually reached the Carpathian region when the monks of Kiev founded a monastery on Chernecha Hora near Mukachevo and dedicated it to the honor of St. Nicholas. From that time St. Nicholas became the heavenly Patron Saint of the Ruthenian Church in Subcarpathia, where devotion to him became deeply rooted in the hearts of our people. The Greeks never accepted the Feast of Translation into their liturgical calendar since the translation occu rred after the Eastern Schism of 1054. This fact tends to indicate that the Church of Kiev and, consequently, the Ruthenian people of Subcarpathia, did not automatically subscribe to the schism of Constantinople for, at the end of the eleventh century, they were still in union with Rome. Thus St. Nicholas becomes for us a witness of the unity of the Chu rches and of the friendly relations of the Ruthenian people with the West. As a matter of fact, it was in the city of Bari that Pope Urban II wanted to celebrate the fi rst synod to discuss the reunion of Churches in 1098. 5. The holy relics of St. Nicholas, reposed in the ad hoc erected sanctuary near Myra in Lycia, remained incorrupt for a long time and secreted an oily substance called myron (ointment). This myron was usually collected and used for the anointing of the sick through which many were healed. Because St. Nicholas continued to work miracles even after his death, his tomb attracted many people and became a celebrated place of pilgrimage. Many pilgrims on their journey to the Holy Land stopped at Myra to venerate his relics and to implore his protection for thei r long voyage. Thus, St. Nicholas became the patron of travellers, especially those journeying by sea. The miracle of myron continued even after the translation of the Saint’s relics to Bari, where it was called ” Manna of St. Nicholas,” and was distributed to the people. During the restoration of St. Nicholas Basilica in Bari, between 1953-1957, the precious relics were once again rexamined and studied, and then deposited into a new tomb in the crypt, where they continue to secrete prodigious manna. The Ruthenian people, who were always poor and oppressed, admired St. Nicholas especially for his works of charity. His inspiring assistance of three poor girls was idealized by them in their popular tales and richly embellished by their folklore. Throughout the centuries this legend sustained the popular devotion to st. Nicholas in Subcarpathia and became an integral part of the Ruthenian spiritual heritage. The supreme Truth has manifested you to your flock as a rule of faith , an example of meekness, and a teacher of moderation ; thus, through humility you atta ined greatness, and through poverty wealth, Father and Hierarch Nicholas, entreat Christ our God to save our souls. 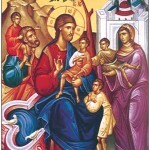 You, 0 Holy One, have exercised your sacred ministry in Myra; and , in fulfillment of Christ’s Gospel , you dedicated your life, 0 Venerable One, to your people and saved the innocent people from death. Thus, you have been sanctified as a great Servant of divine grace. We extol you, Holy Father Nicholas, and we celebrate your memory, for you intercede for us with Christ our God.